Simple – After setting the gage on a known size, production grinding is a breeze! Simply grind until the indicator returns to zero. There is no need to stop the machine to check size, and all guesswork is eliminated. A spring mounting provides sensitive support during grinding, and retracts the gage out of the way during part loading. Installation is also fast and easy. Order one today, and start gaging tomorrow. 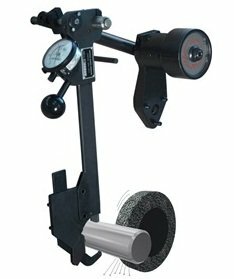 Rugged – The Arnold grinding gage stands up to any harsh grinding environment. Tungsten carbide contact points guarantee maximum wear resistance and longer life. Proven – Since 1918, over 75,000 satisfied customers have been saving time and money using Arnold gages. Compatible – Fits all major crankshaft and OD Grinders. Including Berco, AMC, Storm Vulcan, Winona Van Norman, Cincincati Milicron, etc…. © 2016 Arnold Gauge Company, Inc - All rights reserved.